A new and interesting combat and weapon system, dynamic environment details, and more was revealed in today's Nintendo Direct. 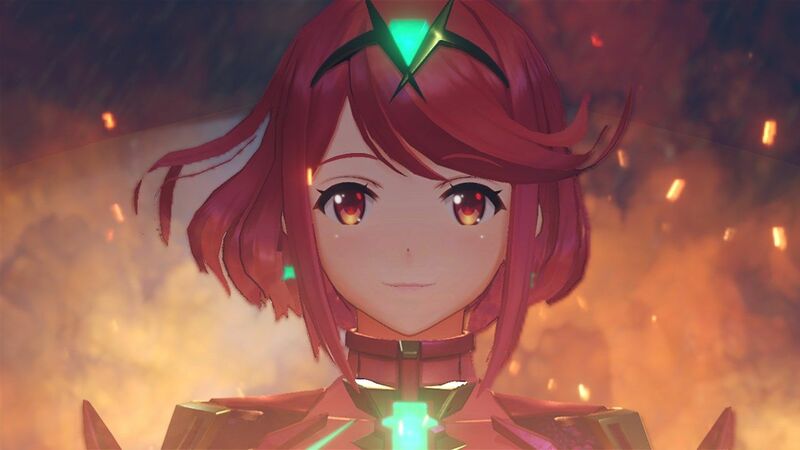 Today, Nintendo hosted a new direct sharing the details for its upcoming epic JRPG Xenoblade Chronicles 2. An intriguing weapon system, dynamic time-of-day mechanics, and more were shared in addition to announcing that the game will be arriving on December 1, 2017. In combat, the lead character will be aided by living weapons. Artificial lifeforms will bond with the Drivers in Xenoblade Chronicles 2 and lend them their powers. Core crystals will have to be found and, when they're touched, will produce one of many potential blades at random. The acquired Blade will be one of three types: Tanks, Attackers, or Healers. This sounds a bit like the loot system in Boyfriend Dungeon, but without the "date your weapons" part. You'll want to gather as many blades as you can to fit different combat situations and there will be moments in the game where you can grow your relationship with blades in addition to leveling them up. One of the Blades even has a retro arcade game that you must play to acquire items to improve a Blade called Poppy. Poppy's elemental properties can be changed, which influences its abilities in combat, and this is exclusive to this particular Blade. This Blade system offers a fresh spin on RPG combat and lets you change your character's class depending on the type of Blades brought to battle. The environments in Xenoblade Chronicles 2 is brought to life by its many monsters inhabiting the area. They're behaviors and appearance in the world will be dynamic and can be influenced by time-of-day. Time of day and other elements will also change what areas are accessible to you. Time can be manipulated in-game. Nintendo is reaching across their exclusive experiences and tying them together by including the Xenoblade Chronicles 2 lead character's costume in Legend of Zelda: Breath of the Wild. It will be accessed via a new side quest that arrives this week on November 9. Xenoblade Chronicles 2's preorder is available starting today November 7 and the game will launch on Nintendo Switch this December 1. A special edition version of the game, including a steelbook, soundtrack, art book, is available for pre-order as well. A limited edition controller will release on the game's release date as well. A reason to get a Switch if you don't have one, I would get a Switch just for this game alone. Xenoblade Chronicles 2 looks epic, I can't wait! I hope they bring an actual remastered Xenoblade Chronicles and Xenoblade Chronicles X to the Switch! There's not a whole lot either game really needs through remastering, thankfully. The new storage medium and additional horsepower will solve the problems of load times and pop in, so if they could push out the object draw distance a bit and refine the XCX ui to work better on a single screen, it'd be perfect. It's really crazy just how gorgeous XC looks, especially for just a Wii game. Maybe not X, but the original is a Wii game and could definitely use a bit of cleaning up. I would definitely buy a Xenoblade Remaster of the first two games if they packaged them together though. Without a thought. Yea XCX doesn't need a remaster it's just XC1 that really does. You have to admit though, XCX in 1080p and 60FPS would be incredible! That is all I really want, or 1080p 30FPS would be pimp too.